This healthy recipe comes from the lovely blogger, Eat Yourself Skinny . 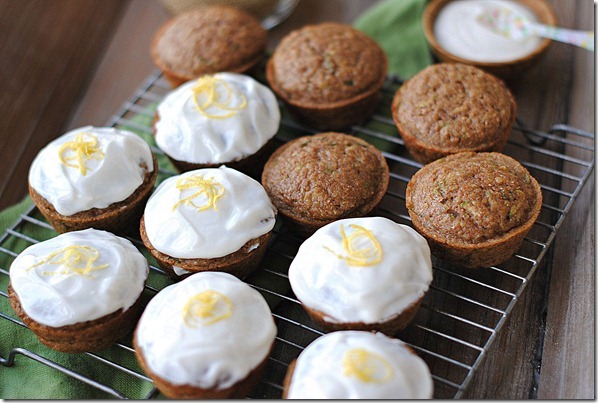 I haven't tried these muffins yet but am excited to bake them this weekend! The muffins are healthy enough to enjoy for breakfast, a snack or even dessert:) Each muffin is only 150 calories and has 6 grams of protein. Preheat oven to 350 degrees. In a bowl, whisk together flour, sugar, cinnamon, baking powder, salt and baking soda and set aside. In another bowl, beat together the eggs and milk and then add quinoa, zucchini, applesauce and vanilla and stir until well mixed. Add the zucchini mixture to the flower mixture and stir until just combined- be careful not to over stir! Coat a muffin tin with nonstick cooking spray and fill each tin 3/4 full. Cook for about 20 minutes or until a toothpick comes out clean. To make the frosting, whisk all of the frosting ingredients into a bowl until smooth. Let the muffins cool before you frost. Frost each muffin with 2 tablespoons frosting. Garnish with a lemon peel and enjoy!